Before beginning a project a good builder will make a blueprint to help him know what the end result is to look like. That will let him know steps needed to get there. God has provided a blueprint for the growth, or building up, of His Church in His Word. 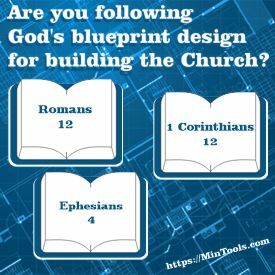 The following passages show us God's Blueprint Design for Building the Church. If we want a healthy, growing Church, we must function according to His intent as laid out in His Word. God's Plan for Reaching the Goals: Gifted leaders and teachers speak the truth in love and are used of God to perfect and equip believers to carry out the work. Notice that leaders do not do all the work. They are equippers. The Body Life Ministry Manual provides more input into each of these passages as well as some helps for further reflection.